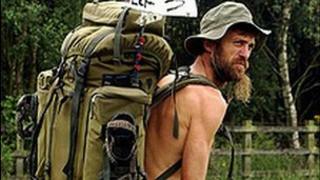 Naked Rambler Stephen Gough has walked free from prison after six years locked up for refusing to wear clothes. The 53-year-old said he was looking forward to seeing his children for the first time in years. A naked Mr Gough was spoken to by police as he was freed from Perth Prison, but was allowed to go on his way in an apparent shift in policy from Tayside Police. On his previous releases, officers re-arrested him within 60 seconds. Former marine Mr Gough, from Eastleigh in Hampshire, first earned the nickname The Naked Rambler by walking unclothed from Land's End to John O'Groats in 2003, after quitting his job as a lorry driver. He has been in prison in Scotland since his second naked ramble in 2006 and has previously been re-arrested for being naked in the street outside Perth Prison at the end of each sentence. Mr Gough welcomed the new police response: "My opinion is that the police have thought 'the guy's not going to give up so let's have a think about it'. "Something has changed and it is good news for me. "What they were doing before was pre-empting complaints and now they are not." Mr Gough said he now plans to head south and hoped to see his children. "I haven't seen my kids for ages," he said and added that he would like to visit his mother, whom he has not seen in six years. He said his children were 16 and 14 and he expected them to be "embarrassed" by him. Gough added: "This is my job. This is my vocation in life at the moment. I have absolutely no regrets, especially now. I think I have partially proved my point by making the police think more carefully about the issue." The 53-year-old revealed he had spent the vast majority of his time in solitary confinement in maximum security Perth Prison. However, he said he had no intention of changing his ways. He said: "To conform with everyone else is the easiest way but when you conform you compromise your principles. "I am not going to give up. Stay naked is the word." Mr Gough has spent the majority of the last decade behind bars due to his determination to live his life without clothes. He first walked naked from Land's End to John O'Groats in 2003, a journey which was punctuated with many visits to prison cells, especially in Scotland. Gough made a second trip in 2005, determined not to put his clothes on, even when stopped by police. That naked ramble was completed in the freezing cold and lashing rain of February 2006. Gough returned to Scotland later that year to answer breach of the peace charges he had picked up during his naked walk. His refusal to wear clothes in court, in prison or in the street has seen him returned to prison on numerous occasions since. Gough has previously claimed arresting him for walking around naked was a breach of his human rights and his right to freedom of expression. Tayside Police said they had a duty to uphold the law but it also had a responsibility to act in the public interest. Ch Insp Andy McCann said: "We have been working closely with our partners in law enforcement and the individual concerned in an effort to resolve this impasse. "We hope that by exercising some discretion we can find a more satisfactory conclusion for all concerned."